Shammy joins in on the fun as JVonD drinks lots of beer and plays tunes from his myspace friends. MYSPACE PROFILES – jimweiderband, thetarhythmband, twigsbeats, richdesoto, flatcatrecords, dougwapner, dougmikula, yogimusic, bradbyrdsound, tomshad1, sigur_ros, bartender_tom. Later in the evening, after many “Official Oblivion Beer Updates” sponsored by “Buddy’s Pub & Home Brew”, Shammy pulls the classic Bagadoosch “Fog Lava” cd off the wall and jams it out. 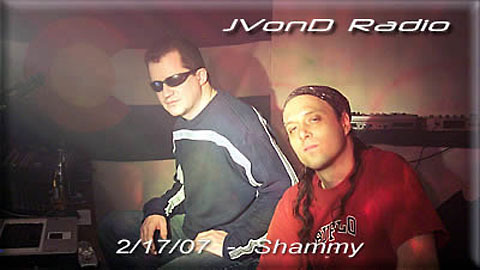 Also hear JVonD’s recent webmix, callins from MB and Rich Palmer, and voicemails.